Peter Vardy today opened his new CarStore at Braehead, Glasgow, offering up to 400 used cars priced from £3,000 to £3,000. At Braehead, Peter Vardy has created a car showroom as a destination venue, not only offering excellent deals, but a fabulous, fun-filled day out for all the family. The enormous new facility for high quality used cars will cover six acres or 70,000 square feet - the largest in Scotland - and visitors will be able to choose from more than 400 cars priced from £3,000 to £30,000. But while they are considering the car of their dreams, the family will also be treated to a terrific time, with a colourful children's play area, ice-cream van, pinball machines and a sumptuous coffee shop in which to have a relaxing, freshly prepared, refreshment. Peter Vardy has pulled out all the stops to revamp the range of cars on offer, the showroom and the staff, providing 70 new jobs in Braehead. And the company, which now has 10 sites in Scotland, will be taking the chance to demonstrate why it has an unequalled reputation for integrity and fair dealing. Because Peter Vardy is motivated by buyer satisfaction rather than the numbers of cars it sells, CarStore staff believe passionately that they will be able to find the right car - the perfect match - for every customer. Equally, they pride themselves that by applying strict standards on warranties and back-up, they will never compromise on quality or safety. Peter Vardy will also check the web daily to make sure customers are getting the best possible deal and will undertake to make buying a car affordable by looking for the best finance package. Gratifyingly, sales people will not pester visitors, but will offer informed guidance when asked. 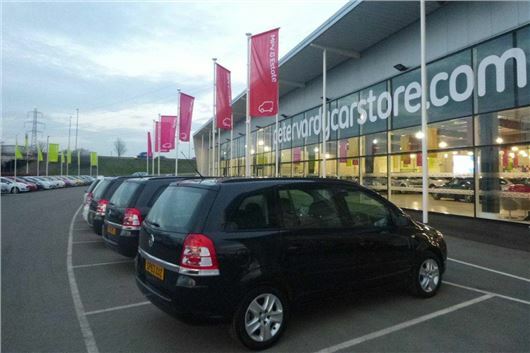 Chief executive Peter Vardy said: "The CarStore is designed to be a destination dealership, where people can take their time in comfortable surroundings to find the car of their dreams and have a huge amount of fun in doing so." Impartial news as ever. How much were you paid to 'write' this?